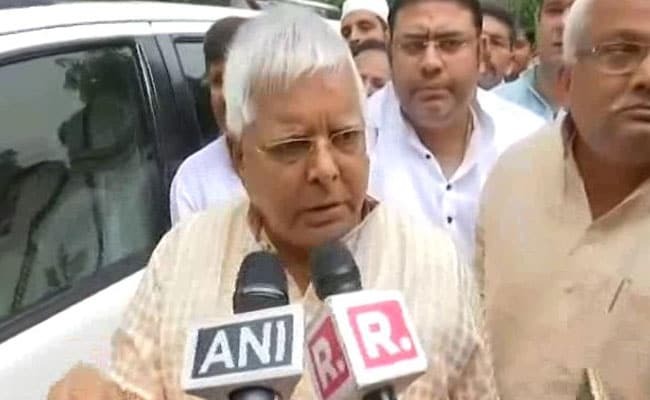 Amidst allegations of jailed RJD president Lalu Prasad Yadav talking to his political associates over phone in violation of jail manual, authorities inspected his ward on Tuesday, but said they did not find anything objectionable. The search was carried out by a joint team of the Birsa Munda prison officials and the Ranchi District Police, a senior police official said on Wednesday. Lalu Yadav has been sentenced in four fodder scam cases by different special CBI courts in Ranchi and is in prison from December, 2017. However, the convicted RJD leader is admitted in the paying ward of the Rajendra Institute of Medical Sciences (RIMS) here for various ailments. "The jail authorities and we (district police) carried out the inspection yesterday (Tuesday) and found nothing objectionable there," senior police official (Sadar) Deepak Kumar Pandey said. The inspection came hours after Bihar Chief Minister Nitish Kumar accused Lalu Prasad of being in touch with his associates over telephone in contravention of the rules applicable to those serving prison sentence. Reacting sharply to Kumar's charge, RJD's Jharkhand unit spokesman Manoj Kumar said, "We condemn Nitish Kumar''s accusations on our leader. When jail officials went and found nothing in the ward, how can Nitish Kumar level such unfounded charges sitting in Patna. Also media reports had on many occasions highlighted RJD supremo's alleged active role in seat-sharing talks among mahagathbandhan (grand alliance) allies - which among others comprises Rashtriya Janata Dal (RJD) and the Congress - in Bihar as well Jharkhand.